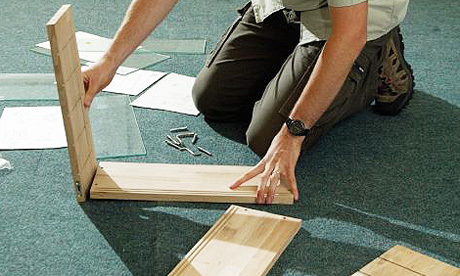 How was Flat Pack Furniture Invented? Easy Flatpax shows you! How was flat pack furniture invented? Ready-to-assemble otherwise known as flat pack furniture was first invented by Gillis Lundgren, who was a Swedish draughtsman. He developed the idea when he needed to fit an IKEA table into his car. According to reports, Lundgren broke the legs off a table he had bought so he could fit it in the car then put them back on at home! He then discussed the idea with his employers at IKEA. The company later built its entire business around the concept, launching its first piece in 1956. Most products IKEA produce now are now ‘flat packed’. Have you ever been to IKEA? You go to the nearest store, wander round picking up pretty things you don’t really need, find the checkouts, pay, figure out how to fit it all in the car, load up then grab yourself a 50c hotdog and then drive it all back home. The next day you open the flat pack furniture box and find a set of cryptic instructions, a bag of screws and different sized bits of wood with holes in odd places only to find yourself at war with your own sanity. It is tedious at best and tantrum-inducing at worst- which is where we at easy flatpax come in, we take the stress away completely! Don’t forget, IKEA offers fantastic guarantees on all their kitchen ranges and appliances, up to 25 years! All assembly work is guaranteed for two years! Our prices are the cheapest around. We go to IKEA at least 3 times a week which is more than any other shopping and delivery service. We’ll happily shop at other stores if IKEA doesn’t have what you want! We will liaise with key holders if you don’t live in Spain. We continue to shop for out of stock items until you tell us not to – no time limits as other services have. If something is damaged or missing, we sort it out for free. There are NO hidden extras with easy flatpax prices! To order any of these items go to our order page or to enquire for more details on any of these items or about our service please contact us.